Archbishop Paul Christian Gerald William Schultz (1931-95) was a member of the San Luigi Orders, being admitted by Prince-Abbot Edmond II on 3 July 1976 in a ceremony in Hollywood, and was the author of “A Brief History of the San Luigi Orders” (1977). He was a bishop of the Mexican National Catholic Church, the Old Roman Catholic Church, the Apostolic Episcopal Church and the Philippine Independent Catholic Church. Paul Schultz was born in Decatur, Indiana, on 10 April 1931. His father, Paul Christian William Adolph Schultz (1900-75) was pastor of Zion Lutheran Church in Decatur for many years, later working with the Division of Gifts and Endowments at Valparaiso University. Schultz graduated from Glendale College, California, in 1950, and then studied for the ministry first at Concordia Theological Seminary, Springfield, Illinois, and then at Pacific Lutheran Theological Seminary. On 30 January 1952 he was ordained priest by Grant Timothy Billet, co-founder and primate of the Old Catholic Church in North America. This action was the cause of a long-term rift between Schultz and his father, and after a short time, Schultz resumed his studies, this time at the University of Heidelberg, where he earned a diploma in basic science and public health. Returning to California, he was appointed as a professor at Los Angeles City College. At this time he came to befriend Prince-Abbot Edmond I. However, he had not altogether abandoned his plans for ministry, and alongside his teaching continued his seminary studies, eventually graduating from California Graduate School of Theology in 1974. He would continue his teaching career, his final appointment being as Professor Emeritus at the Los Angeles College of Chiropractic, Whittier (now part of Southern California University of Health Sciences), and was noted as a popular lecturer. As of 1974, Schultz was a lay member of the First Lutheran Church in Glendale, California. His graduation from seminary that year meant that he finally felt able to fulfil his ministerial vocation. He had also healed the breach with his father and received a Lutheran ordination and consecration from him in October and December 1974, the form of such being to the office of Superintendent and Visitor for the Power of Minister. In consequence, Schultz junior established the Collegiate and German Lutheran Church of the Buffalo Synod Tradition of the Old Lutheran Church. This small group later merged with that of Jürgen Bless, who would himself receive episcopal consecration from Schultz in 1986. The nature of Schultz’s work changed rapidly during the mid-1970s from that of pastor of a small Lutheran community to a much wider ecumenical Catholic mission. The major factor in this was the considerable development of Free Catholicism in California at that time, leading to a number of jurisdictions being based there which represented different Catholic and Orthodox heritages. Schultz was seen as a reliable and trustworthy figure, personally orthodox and of stable life, who was in a good position to build bridges between small jurisdictions whose primates were at times at odds with each other, and who could undertake missions involving contact with the larger churches with credibility. Key to this expansion was Schultz’s role as Prelate and Rector Provincial of New York in the Order of Corporate Reunion (also known as the Order of Christian Renewal). This position came about as a result of the decision of Archbishop Wallace David de Ortega Maxey (1902-92) of Glendale, California, to come out of retirement in 1976 and resume his previous episcopal offices as worldwide Primate of the Apostolic Episcopal Church, Patriarch of Malaga in the Catholicate of the West, President of the Ancient Christian Fellowship and Prelate and Rector Provincial of New York in the Order of Corporate Reunion. During 1976-77, Archbishop Maxey transferred most of his offices to Archbishop Robert Ronald Ramm (also a member of the San Luigi Orders), and Ramm in turn consecrated Schultz Apostolically and installed him for the OCR on 17 October 1976. The OCR had been founded in 1874 as an initiative of the Roman Catholic Archbishop of Milan in order to provide the Church of England with a source of valid Holy Orders, these orders being conveyed by means of additional commissioning through conditional episcopal consecration. During the twentieth-century, its activities – which were always somewhat clandestine – expanded to encompass a wider mission of Christian reunion among the smaller churches. Schultz’s wife, who was Spanish, brought him into closer contact with the Hispanic community in California. Inevitably, his association with San Luigi led to a connexion from 1976 onwards with Archbishop Emile Rodriguez y Fairfield (q.v.) of the Mexican National Catholic Church and the Old Roman Catholic Church of Great Britain under Archbishop Gerard George Shelley. Rodriguez consecrated Schultz on 20 March 1977 for the ORCCGB at a time when Archbishop Shelley was largely inactive due to advanced age and much of the ministerial burden had devolved upon Rodriguez, who would eventually succeed Shelley as Primate. Rodriguez assigned Schultz to administer the See of Caer-Glow and to pastor the MNCC’s California congregation of St Augustine of the Mystical Body of Christ. On 20 May 1978, Schultz received a further conditional consecration from another member of the San Luigi Orders, Archbishop Edgar Ramon Verostek (1909-94) of the North American Old Roman Catholic Church – Utrecht Succession, another of the Carfora-succession churches. On 5 July 1981, Schultz suffered a serious heart attack, to be followed by two more within the ensuing three years. This caused a revision of his responsibilities, and in 1984, having been confronted with irrefutable evidence of Prince-Abbot Edmond II’s mental illness, he ended his work with him, continuing, however, his association with Archbishop Rodriguez. At this time, he became involved with Archbishop Bertil Persson of Sweden in efforts to unite the various jurisdictions of the Apostolic Episcopal Church. This ecumenical communion, which had its origins in a 1925 commission by the Exarch of the Chaldean Catholic Church in the United States, had divided into its separate provinces after the death of its founder in 1948; this had led to rival claims to succeed him with the heads of each of the provinces of the church asserting that they were the true primate. During the 1970s, co-operation was again established between the Scandinavian Province and the Province of the East, United States, and in the 1980s negotiations with Archbishops Ramm and Maxey of the remaining extant Province, the Province of the West, United States (also called the Apostolic Episcopal Catholic Church) likewise bore fruit. This meant that the divided church could once more be united, and accordingly Persson was installed and consecrated as worldwide Primate of the AEC by Maxey, Ramm, Schultz, Rodriguez and other bishops on 7 November 1986 (ratified by a further instrument of 11 June 1988). Schultz was consequently appointed as AEC Provincial of the West from 7 November 1986 onwards. Schultz had noted the historic parallels between the creation of the Mexican National Catholic Church and the Philippine Independent Catholic Church (Iglesia Filipina Independiente) (a member church of the Union of Utrecht of the Old Catholic Churches and of the Anglican Communion). 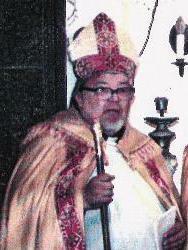 He began a correspondence with the PICC and this in due course led to a historic meeting in Glendale, California, on 15 June 1988, when an intercommunion agreement was signed between the Apostolic Episcopal Church (represented by Archbishop-Primate Persson) and the Philippine Independent Catholic Church (represented by Archbishop Francisco de Jesus Pagtakhan (1916-2008), PICC Archbishop Secretary for Missions, Ecumenical Relations and Foreign Affairs). This event was achieved despite the strong opposition of some elements of the PICC and their Anglican intercommunion partners, who had protested at Pagtakhan’s earlier consecrations for the Continuing Anglican movement and split the church into opposing factions. Nevertheless, this was to be the first official concordat to be achieved between an Anglican Communion and Utrecht Union member church and a Free Catholic communion. Schultz was conditionally consecrated on the same day by Pagtakhan (this was the first occasion when he had been consecrated by three bishops simultaneously, which is a requirement for validity among the Anglicans) and on 24 July 1988 was installed as Bishop of Los Angeles for the PICC. On 14 March 1987, Schultz received conditional consecration from our present Grand Prior of the United States for the San Luigi Orders, Archbishop Peter Paul Brennan (who in 2005 would succeed Archbishop Persson as Universal Primate of the Order of Corporate Reunion) and on the following day Schultz bestowed conditional consecration on Archbishop Brennan in return. The photograph at the top of the page was taken in 1989 when Schultz assisted Archbishop Persson in consecrating the late Karl Barwin as Metropolitan of the Evangelical Catholic Church. Schultz died unexpectedly on 13 September 1995 leaving a widow and three children. His successor as OCR Rector Pro-Provincial of New York would be Archbishop Francis C. Spataro, who in 1998 would succeed Archbishop Persson as Primate of the AEC.